The first step of a journey of a thousand miles is important. If your first experience with a new language is engaging, entertaining and interesting, learning that language is not impossible, but if your first steps down that road are frustrating, boring or confusing, you need strong motivation to not give up. In my experience, most people who don’t like learning languages actually dislike the way they were taught, their teacher or something else in the learning environment, rather than the learning language itself. This is why it’s so important to provide the right guidance and support for new learners. Indeed, Hacking Chinese was created for this very purpose. 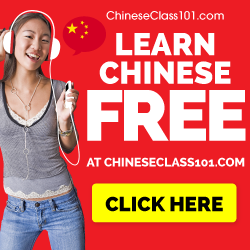 Language Empowerment: Demystify Chinese culture and fire up your Mandarin has the same goal, although the approach is quite different. In this engaging and concise book, Stewart Lee Beck and Katie Lu introduces the reader to the world of learning Chinese, with the emphasis on both language and culture. I found this book interesting because it focuses on aspects of learning Chinese that aren’t usually mentioned in textbooks or brought up by teachers. It combines foreigner student experience with native teacher knowledge, which in my opinion is ideal. Most of the content is not about the language itself, so don’t expect grammar explanations, vocabulary lists and dialogues. Instead, the book is about the learning experience itself, including cultural aspects. Language is of course also a part of the book, but teaching ways of saying certain things in Mandarin is only a secondary goal. There is also a companion book to this one, called China Simplified: History Flashback, but since it feels slightly off-topic to Hacking Chinese, I merely include a link here for those of you who want to check it out. Stewart also says a few things about this book in the interview below. Who is the book for? What is it about? 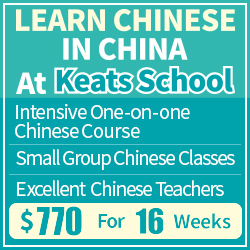 As should be clear by now, this book is mainly for beginners, including people who haven’t started learning Chinese yet. More advanced students will surely find a few interesting expressions or factoids they didn’t know about, but this book si clearly aimed at students who are just setting out on their journey or people who are curious about Chinese. Will we all be speaking Chinese in the near future? As you can see, the range of topics is quite wide. Keep in mind that the book is only 128 pages long, so even if some of the chapter titles could be books in their own right, they actually only contain a short narrative explaining the phenomenon, speckled with anecdotes and examples. The book does not strive to be comprehensive, which is necessary to keep it accessible. For example, in chapter three, Embracing the Ambiguity, you will not learn everything there is to know about how similar words can mean entirely different things to different people, but you will learn that this is a fascinating topic and something to pay attention to, as well as some interesting and sometimes hilarious examples. Learning Mandarin is not only about relabelling the world around you, it’s also about different ways of thinking (check my review of The Geography of Thought here, a book which is also referred to in Language Empowerment). The two authors show up in the book itself in the form of “My Favourite Mistakes” and “Expert Opinion”, which again show the two perspectives of the foreign student and the native teacher. They also show that the author is quite humble regarding his own achievements and wants to give the reader the impression that everybody makes mistakes and that’s fine. This back-and-forth between the authors make the text lighter and easier to read. The combination of an engaging main narrative and illuminating examples is very powerful and is the main reason I recommend the book. 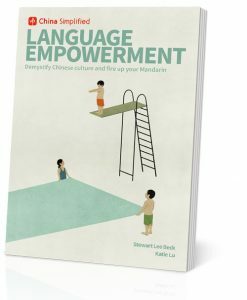 Language Empowerment contains much that beginner students should learn early on, but which is seldom mentioned in textbooks. While the book does contain actual Chinese (more about this later), here I refer to the fact that it covers the basics of how the language works, where it came from, how characters developed, what varieties of Chinese there are and so on. If you take a good university course in the West, you will surely learn these things, but this way is much more entertaining and engaging than any course. If you study in China or on your own, this book gives you a good introduction to some topics you might otherwise miss completely. Most of these things are accurate, although there are exceptions (such as the nonsense on page 7 where it says that if you guess that the tone of a syllable is rising, you’ll be right 50% of the time because both the second and third tone rise; in fact, the third tone is usually a low tone and normally doesn’t rise at all, except in front of other third tones). However, this is an exception and almost everything is accurate. If I were to choose one thing that Language Empowerment provides that most other publications aimed at students of Chinese neglect, I would say inspiration. All the facts, data and many of the examples found here can also be found elsewhere, but not in such an inspiring way. The book simultaneously manages to present information, while still being entertaining and upbeat about learning Chinese. Such inspiration is badly needed! The book contains numerous examples, often with characters, Pinyin and English. In general, these examples work well and illustrate what the authors mean, but I also think that some examples are either exaggerated, misleading or contrived. Let’s start with some positive notes about the language content, though. Many phrases and expressions in the book are directly useful for students, while being very rare in textbooks. This is awesome! For example, in chapter seven, there’s a section about dodging compliments, something I think many struggle with and would benefit from reading. Most textbooks introduce 哪里，哪里 at some point, but seldom do more than translate it and show it in context. Other great examples can be found in chapter three about ambiguity, where you learn what 马上到了, 很难说 and 以后再说 actually mean. However, other examples don’t seem as suitable for the target audience and are merely there to illustrate a point, not to be studied and learnt. 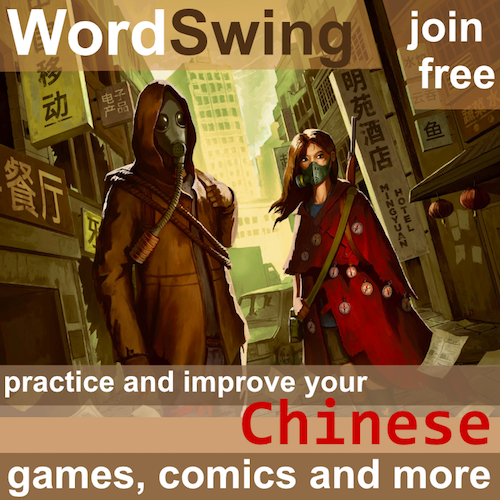 This includes language that is too difficult (most of the idioms) or too informal (slang), or examples that are simply too specific to motivate a table taking up a whole page (animal sounds in Chinese). Some examples also mislead more than they help. For example, while it’s true that through constrained and very deliberate writing, it is possible to write a story using only the syllable yi, this is hardly representative of how Chinese works and isn’t a good argument for why tones are important (don’t get me wrong; tones are important, but since no-one speaks with only one syllable, it’s not good example). And while 走了can mean “have passed away”, it actually just means exactly what it looks like in almost all cases (i.e. “has left”). When I read this book, I can clearly see which phrases I would have benefited from learning early on, and which are there merely to show an example, but it’s hard for beginners to know that. Please note, however, that I don’t think that the major strength of this book lies in the Chinese it contains, but rather the introduction to learning Chinese in general. To summarise, I think Language Empowerment: Demystify Chinese culture and fire up your Mandarin is a neat little book, suitable for anyone who has just started learning Chinese or who is just interested in knowing a little bit about the language and what it’s like learning it. Its strength lies in packing a lot of information and inspiration in a limited number of pages. As such, it should be recommended reading for first-year Chinese students at university, as well as for anyone who’s interested in learning Chinese. The authors manage to introduce a wide range of topics that are typically not discussed in foreign-language classrooms, but are both important and interesting for students. This is done in an engaging style, making the book very easy to read. As Stewart says in the interview below, the reason people in the West don’t know much about China or Chinese is not because of a lack of information, but rather because of a lack of easily accessible information that doesn’t scare people away. If publishing such information was the goal with Language Empowerment: Demystify Chinese culture and fire up your Mandarin, I would consider it a success! To give you something extra, I also did an interview with Stewart Lee Beck. I hope you enjoy it! First things first, could you please introduce yourself? I grew up in Chicago, blissfully unaware of the world beyond our borders. My brother and I had a giant world map on our bedroom wall, and with no internet, I could only imagine what life might be like in all those distant lands. When I arrived in China in 1992, I didn’t speak any Mandarin and was a crap language student. The harder I tried, the more frustrated I became. At the time I thought, no problem, I won’t stay here that long anyway. It turns out I’ve spent decades living and working in China. As the saying goes, man plans and God laughs. What sparked the idea that became your book Language Empowerment? Five years ago I asked myself: Why does 80% of the planet know so little about the other 20%? There have been hundreds of thick books written on China over the last century, and thousands of articles on China appear online every year, yet so many in the West still don’t get the country and its people. There seems to be this cultural blind spot, that the history is unfathomable and the language is impossible. My experience was that most Chinese are, contrary to popular belief, about the same as people anywhere else with similar aspirations. However, they bear an ever-present burden of a weighty cultural legacy in an era of remarkable change and profound contradictions. We launched the China Simplified project to help demystify Chinese language, history, and culture. Our first book China Simplified: Language Empowerment explores Mandarin as an ideal window into the culture and offers practical guidance to up your China game. When I read the book before publication, I said that it deals with many topics that teachers and textbooks overlook. How did you choose the topics covered in the book? My talented co-author Katie Lu and I wanted to share humorous stories about the many ups and downs of language learning. As her struggling student, there were endless opportunities to take the piss out of myself. Mainly, we intended to help people overcome obstacles to becoming more proficient Mandarin speakers, plus find more enjoyment in the process. You and I are kindred spirits towards that goal. Tell us something about the book that only readers of this interview will know, except for the authors of course! One of my primary storytelling influences was Bill Bryson. His book Mother Tongue: English and How It Got That Way opened my eyes to languages as living, ever-morphing organisms. His stories deepened my fascination with Mandarin, and I started looking at language more like an archeologist in search of fascinating relics. The book has been out for some time now, how has it been received? We’ve received very positive reader feedback and support, among newbies in China as well as long-time China veterans. Our Shanghai publisher plans to translate our books into French and German. I’m sure my high school French is of little use there, but our China Simplified team is grateful that our content now benefits more and more people. If a student finishes your book and wants more in the same vein, what can you recommend? Regarding Mandarin resources and optimizing my studies, I most often access two platforms: Hacking Chinese and AllSet Learning. I also follow content from Victor Mair, David Moser, Kevin Rudd, Ash Henson, Carl Gene Fordham, and Khatzumoto. Your readers might also like an insightful book by Deborah Fallows called Dreaming in Chinese. Can you tell us a little bit about the sibling book History Flashback? China Simplified: History Flashback captures 5,000 years of Chinese history into one beautifully illustrated, fast-read volume of under 200 pages. It’s nearly impossible to appreciate the modern Chinese mindset without an understanding of these legendary characters and pivotal events. Thank you for answering my questions! Do you have any final thing to add? 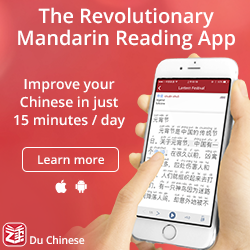 Don’t let the language pessimists out there dissuade you from learning Mandarin. You don’t have to be a Michelin star chef to enjoy cooking. Likewise, you don’t have to memorize 3,500 characters and speak fluent Chinese to have fun with the language and make plenty of new friends along the way. Thank you Stewart! I hope readers will find your answers as interesting as I did!